The green plastids are called chloroplasts. Cell wall and chloroplast are found in plant cell but not in animal cell. Why cells could not be observed before 17th century ? Cells could not be observed before 17th century because microscope was not available for viewing the cells. Why Hooke had to take thin slices of cork ? He made thin slices of cork because the cork was solid and its details could not be seen. Where did Hooke demonstrate cork slice ? Hooke demonstrated cork slice in Royal society of London. Name the cells having branched structure. Which cell is observable with unaided eye ? Name the outermost layer of animal cell. Cell membrane or plasma membrane. Mention the layer outside the plasma membrane of a plant cell. Which four basic elements constitute 90% of protoplasm ? 90% of protoplasm is made up of carbon, hydrogen, nitrogen and oxygen. The term cell was coined by …………. Cell wall is present in …………. only. Which organism has smallest cell ? Bacterium mycoplasmas has the smallest cell. How do you differentiate protoplasm from cytoplasm ? Cytoplasm is the jelly-like substance occupying most of the space inside the cell. Protoplasm includes the cell membrane, the cytoplasm and the nucleus. Draw a typical cell. Label important organelles. What name is given to living things having more than one cell ? Can unicellular organisms be seen with the naked eye ? Unicellular organisms can only be viewed with the help of a microscope. Give two examples of unicellular animals. Name the parts of the cell. The three parts of cell — The Cell membrane, Cytoplasm and Nucleus. What is the jelly-like fluid inside the nucleus called ? The jelly-like fluid inside the nucleus is called nucleoplasm. What is the function of Golgi bodies ? Golgi bodies collect and distribute the substances made in the cell. Which part of the animal cell is concerned with cell division ? Give other name for cell membrane. The clear spaces surrounded by a membrane present in the cytoplasm are called vacuoles. What is meant by division of labour ? In multicellular organisms, the cells are specialised to the perform certain functions. This is known as division of labour. What is meant by cell division ? New cells for growth and reproduction are formed by cell division. Why are the nerve cells long and thread like ? 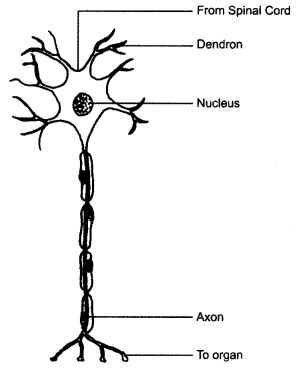 Nerve cells are long and thread-like projections, as they have to convey messages to different parts of the body. Which cells in our body grow and divide all through the life ? The cells of the skin grow and divide all through the life. Name a unicellular organism which is about 10 cm in length. An alga known as Acetabularia. more than a trillion cells. Name the basic structural and functional unit of life. All organisms are made of basic units known as Cell. Nerve Cell is the longest cell in hyman body. Mitochondria is known as the power house of the cell because they perform the function of respiration and provide the cell with energy. Are the cells of an elephant larger than cells of a rat ? No, the size of the cell has no relation with the size of the body of the animal or plant. What are the “building blocks of life” ? Why are they so called ? Cells are building blocks of life because all living things are made up of one or more cells. What is the difference between tissue and organ ? Group of cells of the same type make up the different tissues of the organisms, e.g., muscle tissue. Several different types of tissues together form an organ, e.g., a stomach. Differentiate between an organ and a system. Several different types of tissues that work together to perform one or more life activities is known as an organ. An organ system is a group of organs that work together to carry on life activities. Name an organ system in the human body and the major organs that make up that system. Organ system — Digestive system. It is made up of organs such as intestines, liver, stomach, pancreas, gall bladder. What features are possessed by both plant cells and animal cells ? All plant and animal cells have three parts — cell membrane, cytoplasm and nucleus. Name the organelle known as “suicide bags” ? Why is it called so ? Lysosomes are known as suicide bags. They contain enzymes which help in breaking down or destroying the various materials. Give the functions of cell wall. It provides rigidity to the cell wall. It provides protection against plant viruses and pathogens. Protoplasm is made up of compounds of carbon, hydrogen, nitrogen and oxygen. Name the largest and the smallest cells in the living world. Tomatoes are red and leaves are green. Why ? Plant cells are more rigid in shape than animal cells due to the presence of cell wall. Smallest – PPLO (Pleuro Pneumonia Like Organisms). Tomatoes are red because of chromoplasts in their cells. Leaves are green because of chloroplasts in their cells. Distinguish between prokaryotes and eukaryotes. (i) The organisms having prokaryotic cells are called prokaryotes. (i) The organisms have eukaryotic cells are called eukaryotes. (ii) In prokaryotes, there is no nuclear membrane in cells. (ii) There is a nuclear membrane around the nucleus. (iii) e.g., Bacteria and blue green algae (iii) e.g., Onion cells and cheek cells. Make a sketch of the human nerve cell. What function do nerve cells perform ? 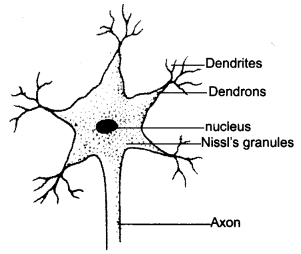 Nerve cell — Nerve cells receive messages through dendron and transfer it through axon. If you boil a hen’s egg, what changes do you observe ? When a hen’s egg is boiled, a white material surrounds the yellow part. White material is albumin which solidifies on boiling. The yellow component is yolk. What are the functions of the cell membrane ? It provides shape to the cell. It allows materials to enter and leave the cell through the tiny holes. Endoplasmic reticulum being a network of membranes, provides a large surface area for life functions to take place. Golgi complex collects and distributes the substance made in the cell and it synthesises and secretes many materials. Ribosomes is the site of protein synthesis. Who discovered the cell ? Living things are made up of tiny living parts known as cells. Robert Hooke, an English scientist in 1665 discovered the cell. Amoeba is a microscopic organism. (ii) Chloroplasts are absent. (ii) Chloroplasts are present. (iv) Vacuoles are absent; small in size. 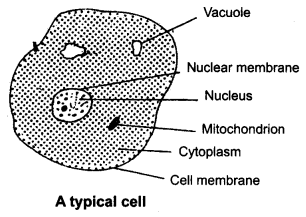 (iv) Vacuoles are present and larger in size. Unicellular organisms have one-celled body. The basic living unit of an organism is an organ. Amoeba has a irregular shape. Cytoplasm is the fluid present between the cell membrane and the nucleus. Organelles of cells are present in the cytoplasm. These are mitochondria, Golgi bodies, ribosomes, etc. Cytoplasm is made up of basic elements like C, H, O, and N. They are found in the form ef carbohydrates, proteins and water. Nucleus of a cell is generally spherical and located in the centre of the cell. Nucleus is separated from the cytoplasm by a membrane called the nuclear membrane. Nucleus also contains nucleolus and chromosomes. Nucleus helps in inheritance and acts as control centre of the activities of the cell. Describe the variations in shape and size of cells. Cell size. Some cells are very small and visible only with a microscope. Smallest cell is of bacterium, PPLO. An ostrich egg is the largest animal cell. In plants an alga, Acetabularia has a single cell of about 10 cm in length. Cell shapes are very diverse. Some cells like those of Amoeba and white blood cells continuously change their shape. Most cells, however, maintain their constant shape. The shape of the cell is related to its function. Name the different parts of the nucleus and give the function of each part. Nuclear membrane — It separates the nucleus from the cytoplasm. It allows the exchange of substances between the nucleoplasm and the cytoplasm. Nucleoplasm — Chromosomes and nucleoli are present in the nucleoplasm. Chromosomes — Play an important role in the inheritance of characters from one generation to another. Vacuoles store the chemicalproducts which accumulate within the cell due to the various life functions taking place inside the cell. Centrioles present in animal cells are concerned with cell division. Cellulose is present in plant cell and provides rigidity and protection to the cell. Plasma membrane protects the cell and allows materials to enter and leave through the tiny holes. Nucleus controls everything that takes place in the cell. The cell divides and splits into two parts known as daughter cells. The daughter cells are identical to the parent cell. The nucleus of the parent cell divides into two, followed by the division of cytoplasm. Finally, the two daughter cells are formed. In multicellular organisms, the cells divide for reproduction and also multiply for growth. The increase in the number of cells is brought about by cell division. The cells so produced undergo a change in size and shape and the whole organism shows over all growth. Which of the following is covered by a single membrane ? Which organelle is known as the store house of the ! cell ? Which of the following is not unicellular ? Which of these cells will have cell wall around them ?